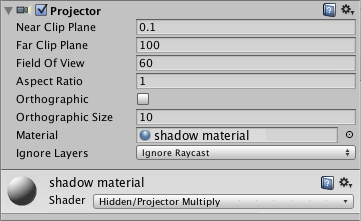 See in Glossary for examples of how to use the supplied Projector/Light and Projector/Multiply shaders. 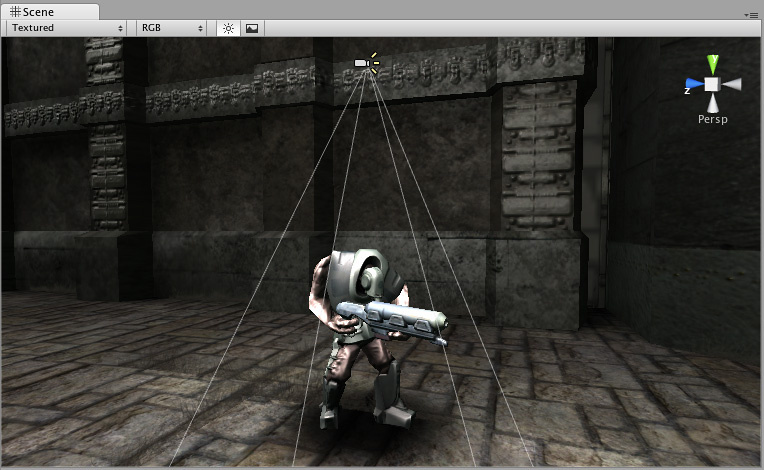 Near Clip Plane Objects in front of the near clip plane will not be projected upon. Far Clip Plane Objects beyond this distance will not be affected. Field Of View The field of view in degrees. This is only used if the Projector is not Ortho Graphic. Aspect RatioThe relationship of an image’s proportional dimensions, such as its width and height. See in Glossary The Aspect Ratio of the Projector. This allows you to tune the height vs width of the Projector. Is Ortho Graphic If enabled, the Projector will be Ortho Graphic instead of perspective. Ortho Graphic Size The Ortho Graphic size of the Projection. this is only used if Is Ortho Graphic is turned on. Material The Material that will be Projected onto Objects. Ignore Layers Objects that are in one of the Ignore Layers will not be affected. By default, Ignore Layers is none so all geometry that intersects the Projector frustum will be affected. See in Glossary into your scene. You can modify the Material to use a different Blob shadow texture. Note: When creating a projector, always be sure to set the wrap mode of the texture’s material of the projector to clamp. else the projector’s texture will be seen repeated and you will not achieve the desired effect of shadow over your character. Projector Blob shadows can create very impressive Splinter Cell-like lighting effects if used to shadow the environment properly.